As a Farm Animal Law & Policy intern at the Animal Welfare Institute (AWI) in Washington, D.C., I spent my summer working primarily on regulatory issues. For example, I synthesized information relating to the international transport of cattle, pigs, sheep, and goats to determine whether a new rule was being properly enforced by the USDA. Additionally, I created exhibits for an upcoming food-label challenge and wrote articles for AWI’s quarterly publication. I was also able to attend several lobbying meetings on Capitol Hill and accompany AWI’s Equine Protection Manager to a livestock auction in Pennsylvania. My academic coursework prepared me particularly well in terms of my grasp on farm animal issues, the regulatory process, and the strategy involved in advocacy. On the whole, this past year has given me the knowledge and experience I need to pursue a career lobbying on behalf of animals at the state level. 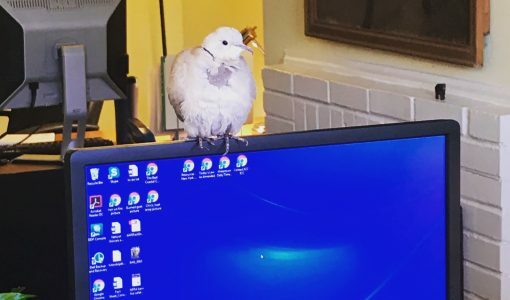 Note about featured image above: AWI’s resident rescue dove, Hortense. She lives in the farm animal department’s offices and has free reign of this territory. It was very calming to hear her coos coming from the other room while I was working on various projects this summer.